1984. Marudo Koi farm – Minaminigoro village. 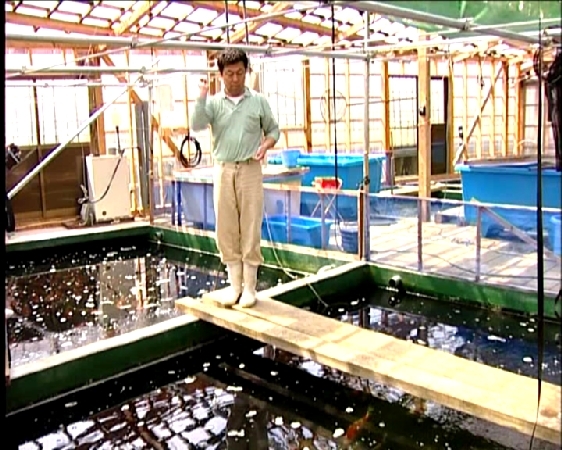 I was first taken here by Megumi Yoshida back in the days when the father, Hirasawa San, ran the business and the son Hisashi, who now owns the business, was honing his experiences in Koi breeding at the Dainichi farm. Then, the only trading premises were some sheltered concrete ponds directly opposite the ancient wooden dwelling house. As I recall, there were only general-grade Koi there at the time, many average Asagi and Gin Matsuba accounted for 80% of the Koi displayed and the water appeared to be cloudy. It was not until 1994 when I first started to see significant signs of improvement here after Hisashi took over the reins with a bang and built an indoor private Koi house for his tategoi on flat lands near Ojiya some five miles away. I then began to see some superb and high class Koi at this outlet and so did others. It was around 1994 when Geoff Kemp accompanied us for his first visit to Japan. As we were driving through the mountains he told us that he had been recommended to visit a breeder named ‘Maldo’ which he had jotted down back in the UK. To me, that name sounded more Italian than Japanese and it was days later we finally discovered that he really meant ‘Marudo’. My very first impressions – ‘this man will be out of business soon’. How very pleasantly wrong I was!